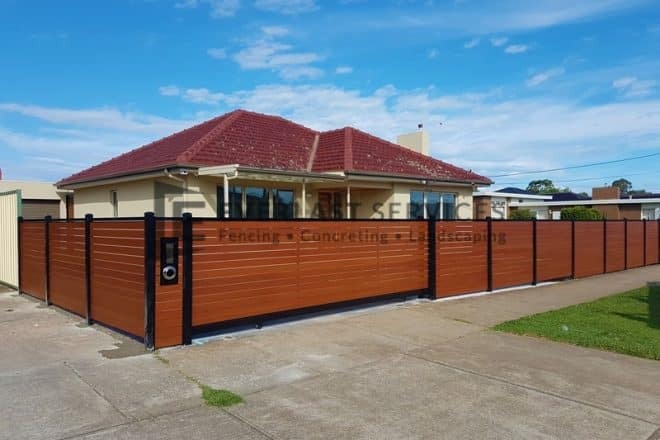 Aluminium is an ever dependable and secure fencing material for many homeowners, notable for requiring relatively little upkeep to perform at its best. It’s popularly used in slat fences, which use long, narrow pieces to overlap each other. These fences are reliably secure, exceptionally private, and bring a beautiful modern aesthetic to a property’s exterior. For these reasons it’s prized over traditional wood fences which may be cheaper initially, but with proper maintenance can cost a fair bit out of pocket over time. That said, as all things do from time to time, aluminium will tend to collect dirt, dust, plant residue and the like, requiring a bit of modest cleaning to keep it looking neat and tidy. Here’s what you need to know in order to keep it looking great, without damaging the finish or the material itself. It’s important to understand how aluminium is treated before being used. What gives commercial aluminium fences its characteristic sheen and finish is a process known as powdercoating, This is where a coating of fine powder is applied to the metal by charging it with an electric current, which then finishes into a protective, resistant cover. Because of this, you’ll want to avoid anything that could damage the powdercoating. Though it’s quite difficult to damage the coating through conventional means, solvents like acetone can easily cut through the coating, as will abrasives like steel wool. Obviously, be careful to avoid any cleaning products that contain solvents. You’ll want to begin by thoroughly hosing down all the slats with a garden hose. You want to make sure to hose off any dirt or foliage that may be stuck. Next, take a wet sponge with a bit of soap to remove anything else lingering on the surface. Ensure that you’ve covered the whole area with a bit of detergent. Lastly, hose off all the soap and leave it to dry, or manually dry with a spare rag. If there are still residues or build-ups of unknown materials, use a mild abrasive or brush to scrub them off. Then, rinse thoroughly afterwards. Moulds can be a particularly annoying and dangerous hazard for those living in warmer climates. For more stubborn organic stains that just won’t quit, a simple DIY solution can work. Simply mix equal parts water and vinegar. Apply the solution using a spray bottle or a cloth. This will all but kill most natural stains given half an hour or so. Afterwards, continue to scrub and wash the fence. As a general rule of thumb, you’ll want to give an aluminium fence a clean about every 12-18 months. This will depend on whether your fence is located near foliage and the type of animal life around your home, amongst other things. Plants that start to grow around the slats aren’t a big problem. But they can wear away the coating if left unchecked. You can obviously clean your fence as frequently you see fit. However, we recommend inspecting the entire length of your fence every year to check for signs of damage or oxidation. Aluminium is usually a resilient material that can be left on its own for long periods of time. However, through interacting with the air, the surface of the fence will oxidise and lose some of its lustre. A common DIY tip to maximise lustre and protecting against wear is to take apply regular car wax to your fence with a cloth. Once coated, leave the wax on the fence for an hour before removing it. Waxing works to reverse some of the oxidation whilst returning the shine back to the fence. If the fence includes a gate, normal gate maintenance applies. Ensure that the hinges are securely fastened on, and lubricated with oil if necessary. If you begin to notice scratches or chips in the aluminium, this isn’t a cause for huge concern. However it’s understandable to want the fence looking as well-maintained as possible. Fortunately, there are specialist paints that can cover up these chips. This is slightly more complex with custom finishes on the aluminium, such as those intended to resemble wood finishes. It’s advised that you contact the company that produced the slats to ensure the aesthetic integrity is maintained. Take specific care when clipping or maintaining foliage around the fencing. Sharp gardening tools are able to easily scratch the surface and leave lasting marks. For more information about aluminium fencing options, contact Everlast services today.